Facebook has a long list of supported formats for video and they cover almost all video codecs known to man. It is recommended that you use a MOV or MP4 codec with an aspect ratio no larger that 4000px wide and a frame rate below 30 fps with stereo audio at 44,100hz. This codec will give you the best results as far quality and compression. Try to keep your dimension to multiples of 16px for best results. You have two options with aspect ratio, you can go the traditional way and use 16:9, which is the way we watch everything on TV, and the way normal people do it, or you can flip it to 9:16 which is vertical video. I hate vertical video but I not here to judge. 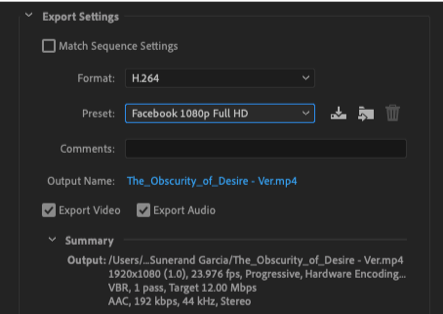 If you happen to own a professional editing application like Adobe Premiere Pro it’s very easy to export to FaceBook settings. First go to Export from the file menu, then select Media. Make sure you have your sequence selected or this option will be grayed out but don’t panic, just click on your sequence and try again. Or, you can skip all the rigmarole and just hit the Command M on a Mac or Control M on a PC. You still have to make sure you sequence is selected. 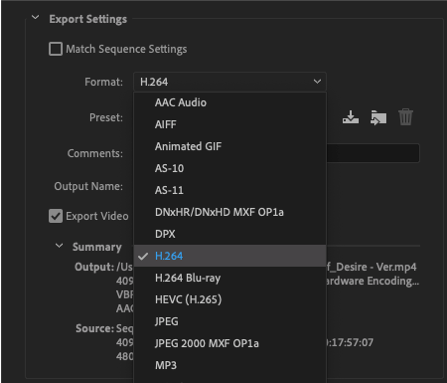 Once you are on the Export Settings Screen, select H.264 from the Format dropdown menu. For more tips and rants about video visit https://deconstructivemedia.com/blog/. You can follow me on instagram @rafaelr.meneses.